Much has been said about the military’s effort to incorporate social media platforms into its arsenal of weapons. Over the past two years, there have been several detailed reports claiming that the armed forces are engaging in large scale social media manipulation initiatives. In his article, “Military’s ‘persona’ software cost millions, used for ‘classified social media activities’”, Stephen Webster provides details about a contract issued by the USAF to develop software that will allow it to create, manage, and operate an army of sock puppets worldwide. 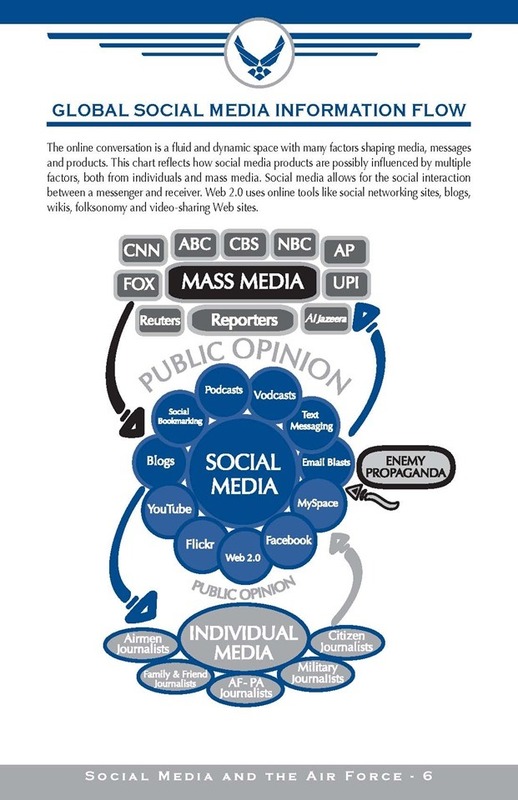 In a different article, “US Military Caught Manipulating Social Media, Running Mass Propaganda Accounts” Anthony Gucciardi describes how this is done. The fact that the military is using SN manipulation tools to fight the war is laudable. It’s about time they started using non conventional solutions to carry the war into the back alley Internet cafes where virtual battlefields of radicalization are raging. Do not post classified or sensitive information (for example, troop movement, force size, weapons details, etc.). If in doubt, talk to your supervisor or security manager. When you see misrepresentations made about the Air Force in social media, you may certainly use your blog, their’s, or someone else’s to point out the error. Always do so with respect and with the facts. When you speak to someone with an adversarial position, make sure that what you say is factual and is not disparaging. Avoid arguments. Be the first to respond to your own mistakes. If you make an error, be up front about your mistake and correct it quickly. If you choose to modify an earlier post, make it clear that you have done so (such as by using the strikethrough function). Remember there are always consequences to what you write. If you’re still unsure, and the post is about the Air Force, discuss your proposed post with your supervisor. Ultimately, however, you have sole responsibility for what you choose to post to your blog. racially and ethnically hateful, or otherwise offensive or illegal information or material. Do not post any information or other material protected by copyright without the permission of the copyright owner. Also, consider using a Creative Commons license to protect your own work (see http://creativecommons.org for details). Do not post any information that would infringe upon the proprietary, privacy or personal rights of others. Do not use the Air Force name to endorse or promote products, opinions or causes. Do not forge or otherwise manipulate identifiers in your post in an attempt to disguise, impersonate or otherwise misrepresent your identity or affiliation with any other person or entity. discuss areas of expertise for which you have no background or knowledge. Considering the fact that SN bridges numerous EULA and jurisdictional boundaries, it’s likely that these tools will end up violating some privacy laws. But with that having been said, I also have the utmost faith in the military’s ability to regulate and control itself. Between the office of the inspector general, the Uniform Code of Military Justice, and the clear constitutional limitations imposed on the military’s ability to operate on US soil, I think that there are enough checks and balances to prevent wide scale domestic Orwellian style abuse of this technology. So, what seems to be the problem? Well, the biggest issue is that parts of the SM intelligence collection, monitoring, and analysis are no longer being carried out by the military/three letter government agencies. Rather, it’s being conducted by a horde of private intelligence firms. Some of these include: Palantir, Stratfor, HBGary Federal, Berico Technologies, Endgame Systems, and Booz Allen Hamilton which recently gained notoriety thanks to Edward Snowden’s mega leaks. A better insight into the functioning of this rent-an-intelligence world of shadows can be gleaned from the hack by LulzSec. 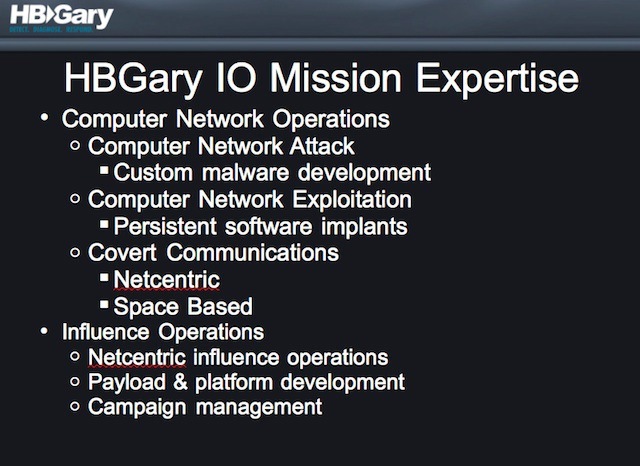 In 2010, the group successfully breached the private intelligence firm HBGary/HBGary Federal. The hack captured over 75,000 e-mails. It revealed the close cooperation between large commercial firms such as Bank of America and various government agencies. For example, it showed that BoA solicited the Department of Justice for help regarding possible disclosure by WikiLeaks. The Department of Justice then referred BoA to the political lobby firm Hunton and Willliams, which in turn connected the bank with a group of information security ‘fixers’ known as Team Themis. 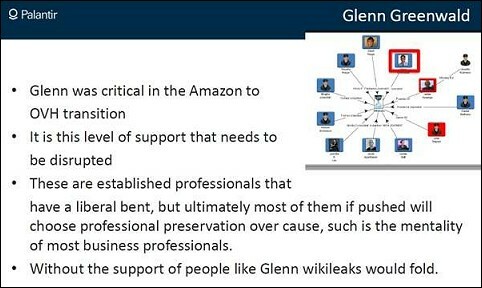 Team Themis—a group made up of HBGary Federal and the intelligence firms Palantir Technologies (named after Saruman’s seeing stone in J. R. Tolkien’s Lord of the Rings), Berico Technologies, and Endgame Systems—was consulted regarding ways to destroy the credibility of WikiLeaks and Glenn Greenwald, a Salon.com reporter who wrote favorably about WikiLeaks. 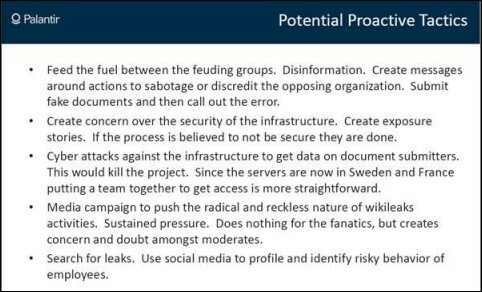 The strategy, sought to “sabotage or discredit the opposing organization” and even included a plan to submit fake leaked documents and then call out the error. Interestingly, some of the leaked documents contained Palantir’s and HBGary’s PowerPoint decks and e-mails which detailed various Machiavellian schemes. A notable example was the strategy for destroying the credibility of Glenn Greenwald. Even more troubling were plans to use malicious software to hack into computers owned by the opponents and their families. The e-mails show a proposal to develop and use “custom malware” and “zero day” exploits to gain control of a target’s computer network in order to snoop their files, delete content, monitor keystrokes, and manipulate websites. 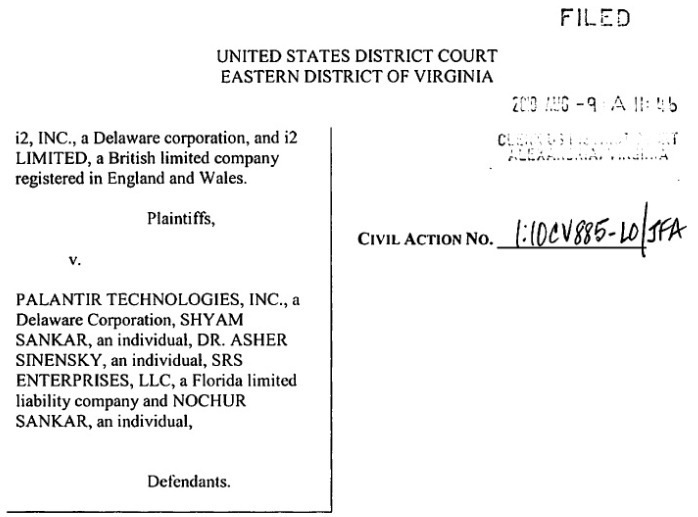 It turns out that Palantir, in addition to living the “gangsta” life style to the fullest was also shooting ‘sideways’ at it’s competitors by allegedly misappropriating IP by fraudulent means and conducting domestic industrial espionage. 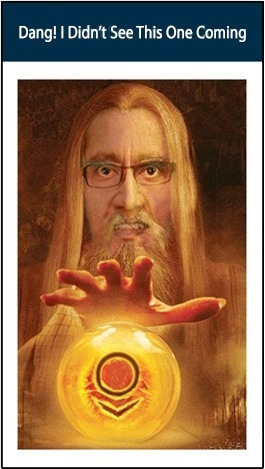 The bizarre story revolves around Shyam Sankar, Palantir’s Director of Forward Deployed Engineering who allegedly represented himself as a principal of SRS Enterprises, a straw company registered under the names of his parents in Florida, he and his brother fraudulently obtained i2 competing software solutions and used them to design Palantir’s products. I don’t know if any of these allegations are true because the case was just settled before going to trail, but if even some of details are correct, this is the stuff that spy novels are made out of. I’m not sure what I find to be more outrages in this case, Palantir’s complete disregard for the law or their nonchalant gangster attitude. 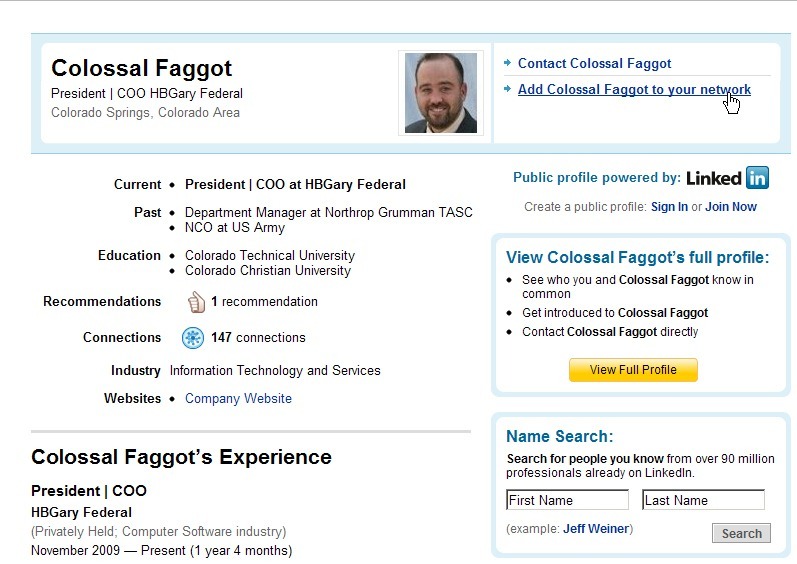 I have no problem rationalizing the military’s proposal to carefully use software like MetalGear to conduct “classified blogging activities on foreign-language Web sites to enable CENTCOM to counter violent extremist and enemy propaganda outside the U.S.”, but Palantir and HBGary were proposing to use such technologies wholesale on US soil for subversive (and most likely illegal) corporate and financial gain. 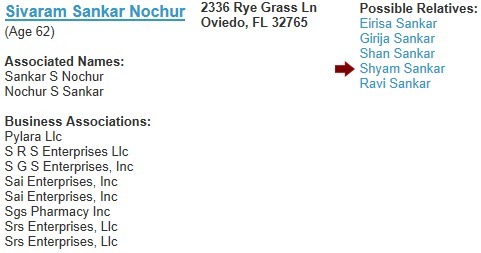 Several months after the attack against HBGary Federal, Anonymous hacked into another private intelligence firm Stratfor. They released a stash of about five million e-mails which provided deep insight into how the private security/intelligence companies view themselves vis-a-vis government agencies like the C.I.A. and F.B.I. Reading this statement makes you wonder how the C.I.A has ever managed all of these years without Strafor’s robust, visionary, and courageous guidance. Stratfor Also illustrated their ability to collect deep intelligence by performing private surveillance activities on US soil of protestors in Occupy Austin movement. 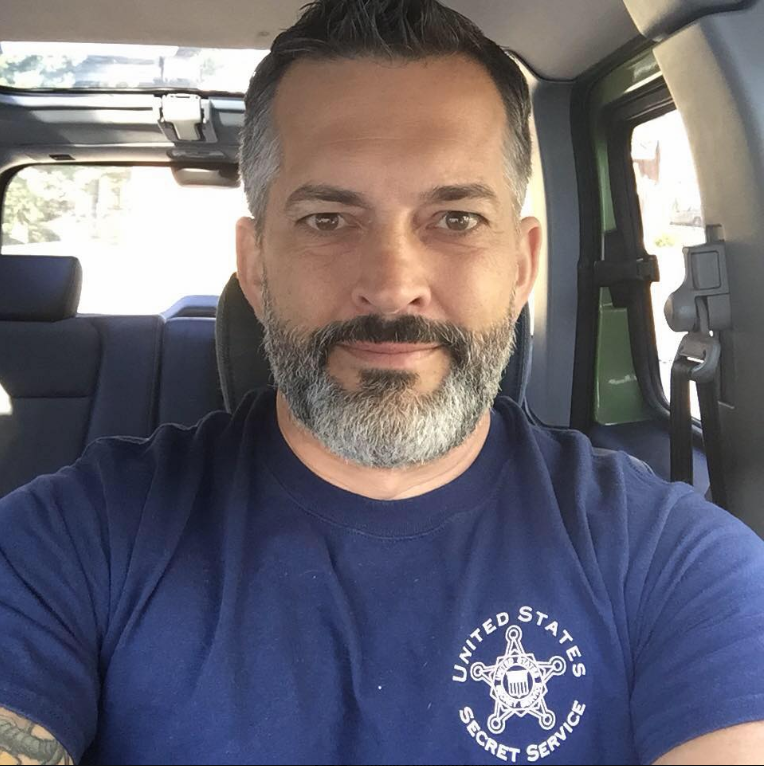 To achieve this, one of their agents went undercover and joined an Occupy Austin meeting in order to gain insight into how the group operated. Now, I could understand if Strafor was offering supplementary intel to various government agencies, but the ironic implication here is that they are syphoning classified information from the government and handing it over to their corporate clients. Indeed, as Morpheus stated, “Fate, it seems, is not without its sense of irony”, Stratfor, the organization that prided itself on teaching the C.I.A a thing or two about security and intelligence gathering got Pwnd through the most benign means. HBGary website failed through a simple SQL injection. The site didn’t scrub nor sanitize any requests. This allowed the attackers to quickly retrieve the site’s User IDs and Passwords. With a User ID and Password in their possession, they download the entire user database. Next, they proceeded to crack it. If the password database was properly protected, they would have gotten nowhere, but again, poor security design enabled them to retrieve all the passwords. It turns out that the HBGary Federal database stored passwords in simple MD5 hashes. To overcome this, the attackers used readily available rainbow tables. 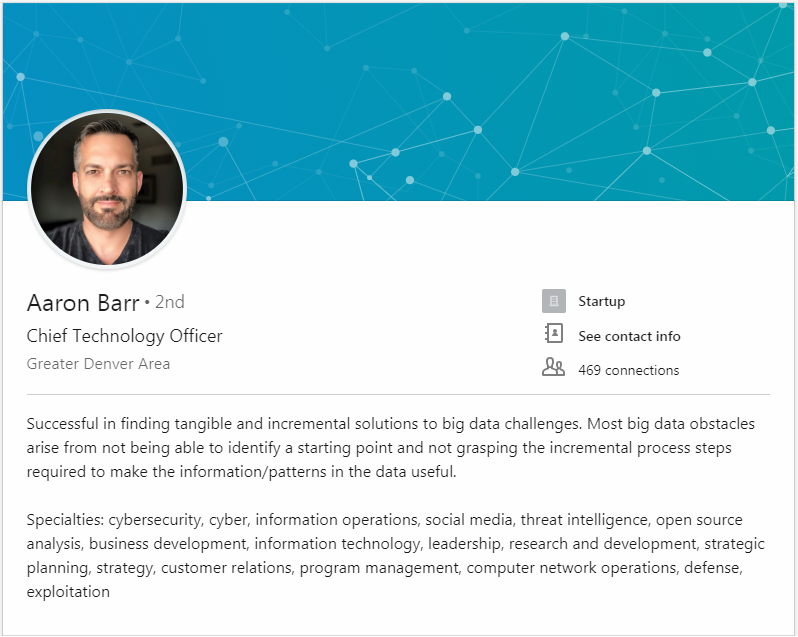 After getting the passwords of two of HBGary’s executives, Aaron Barr and Ted Vera, they discovered that the passwords only consisted of eight characters: six lower-case letters and two numbers. With the User ID and Password details of the two executives, the attackers found out that this pair reused their passwords in multiple applicaitons, including: e-mail accounts, LinkedIn (see bellow), Twitter and a customer facing server. So now Anonymous was able to access their e-mails too. The accounts on the support server belonged to ordinary users but the system wasn’t patched against a privilege elevation attack. 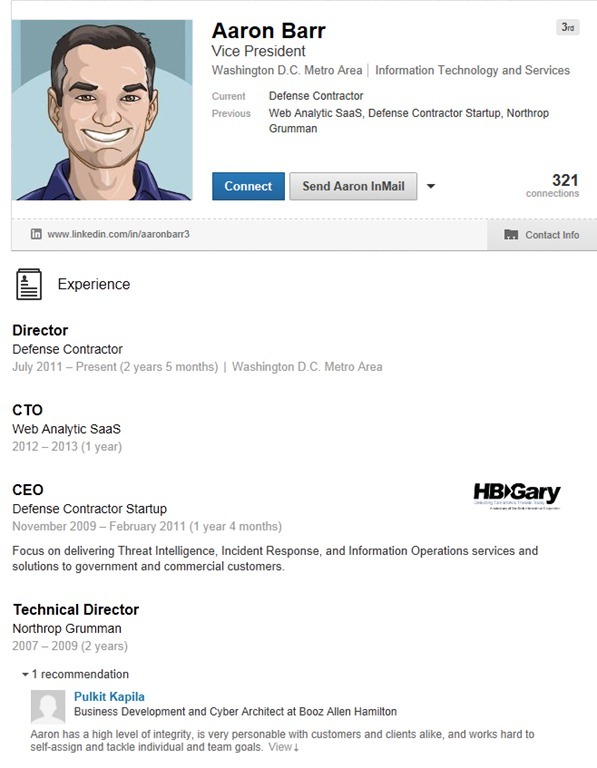 Now, with administrative access and due to the fact that one of the executives was also the administrator of the entire e-mail system, Anonymous gained full control of all HBGary Federal e-mail accounts. Using this vulnerability, they gained access to the account of another executive, Greg Hoglund, where they found an e-mail containing the root password for the entire site. Anonymous had a root password, but couldn’t access the site server from outside of the firewall. They needed to login as a standard user and then switch to root. To achieve this, they utilized a simple social engineering exploit. Using Greg Hoglund’s account, they contacted an administrator who had root access to the server. 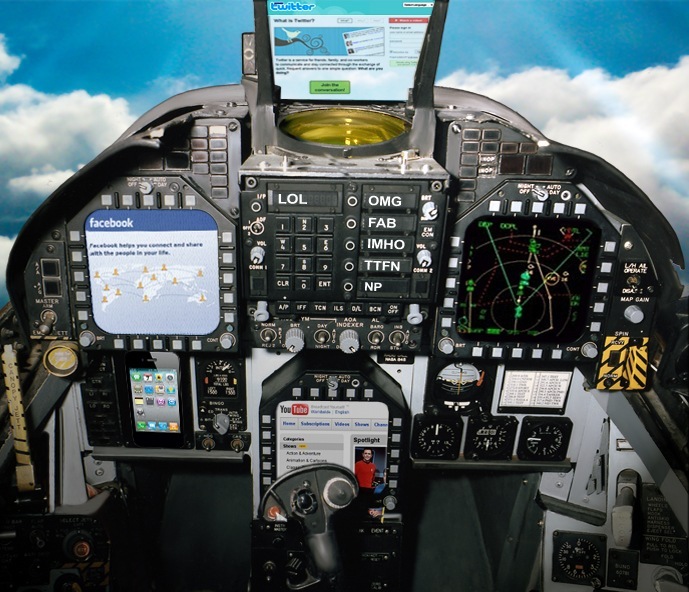 Through an e-mail exchange, they said that they had a problem logging in to the server and convinced the root admin to reset Greg’s password and also reveal his username–the two pieces of information they needed to complete their exploit and gain access to the Stratfor list of customers and their credit card files, which interestingly enough, were kept in a plane text file. This wasn’t unique to HBGary or Strafor. In all hacking cases involving private security or intelligence companies, the analysis of the attack shows that it was executed via the most rudimentary methods. No mission impossible scenarios took place, the root cause was just your common run of the mill information security negligence and incompetence. Time and time again, these von Wallenstein style wannabe spies have proven themselves to be a legal and an ethical liability. Case in point is that regardless of their patriotic pitch and public assertions of lofty ideals such as “solve the most important problems for the world’s most important institutions”, most of these individuals and companies are bottom feeders who are in it just for a fistful of dollars and narcissistic bragging rights. From the various e-mails disclosed, its obvious that they have no qualms conducting criminal influence operations against their customer’s political opponents and their families on US soil. 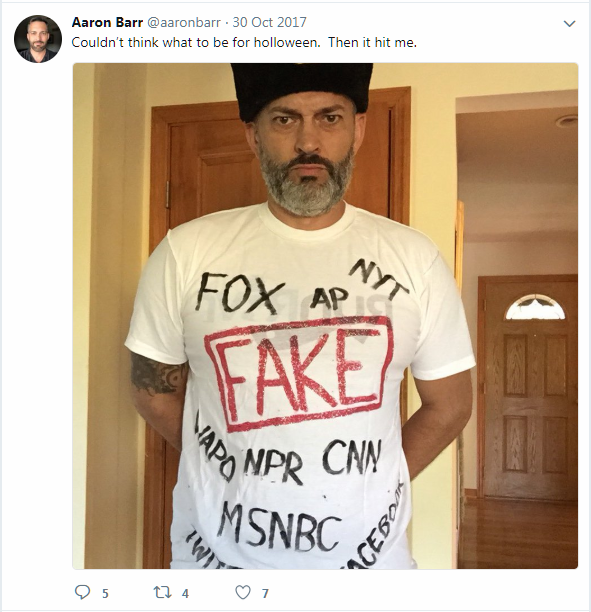 The complete lack of moral scruples from guns for hire, like Aaron Barr, who engaged in the worst type of for-pay defamation doesn’t seem to change with time. Barr—after scrubbing his on-line persona several times—resurfaces in 2015 as a progressive, environmentally friendly activist this time dedicated to promoting Russian collusion theories, climate change awareness, and bemoaning the loss of on-line privacy. Regardless of how attractive privatizing national security may seem at the moment, ultimately national intelligence should be managed by military and career civil servants that should report to elected officials who in turn should have specific term limits. True, this may not be the best way; after all, J Edgar Hoover managed to abuse the process throughout the terms of six different presidents. But in the end, the system does self-correct. It has been doing that now for over two hundred years.